It is perfect if you want to escape the daily stress and frustrations of life. Paying utilities bills every month can be a really frustrating task. Water, gas, phone and power bills all haunt you each month when you go out to the morning paper and hesitantly check the mailbox. For some people paying bills can be an extremely hard task, especially when they are working 2 or 3 jobs. A considerable portion of your wages goes directly into paying the bills. But what if you can cut back on some of the things, what if there was a way of completely living off the grid? Well, fortunately for you, there are indeed a number of ways to escape the pressure of paying your monthly bills. 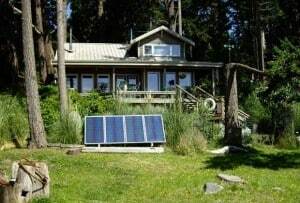 Living off the grid is becoming quite popular these days and people are opting for a life free of financial constraints and are instead choosing to live independently. And by independently it means to permanently or at least try not to depend entirely on natural resources. The grid refers to a linked system of electrical power units (those large wired poles you see on your drive back home) that deliver power in the form of electricity and telephone lines to households and corporations all over the country. There is a separate grid system for water and natural gas. Living off the grid requires shutting down all these power utilities which keep the light, gas and water going in your house. Don’t worry, you won’t have to live like a caveman; there are ways that you can create your own utilities. Many homeowners choose to get their power grid off for electricity and develop a way produce their own power. This way, they can live off the city’s water and sewerage system. On the other hand, many homeowners tend to cut off their water supply and dig wells to be self-sufficient as far as water is concerned. They take care of the sewage by getting septic tanks installed and voila, no water and sewerage bills ever! In the US, there are quite a lot of people who are living off the grid and becoming self-reliant on some form of fossil fuels or the other. It is still difficult to accurately measure how many people are doing it. However, in 2006, Home Power magazine published an article which showed that there are over 180,000 homeowners who have successfully become independent and produce the electricity they need. They have also cut off the other utilities. Though households who get off the grid tend to be the ones already located in far-off locations, there are now people living in urban areas and big cities who created their own sustainable methods to create and harness energy in the form of electricity and water. Many city dwellers are now living off the grid in order to cut back on their bills and save money, plus they also give something back to the environment. In order to live a life a life off the grid, the first thing you need to get rid of is electricity. You can contact the power company and get your power cut off very easily. In order to produce your own power, you will need to harness the power of the wind and the light from the sun. Harnessing the power of nature to create different forms of energy is a concept that is quite commonly used nowadays and many know about alternate energy systems. Having said this, many people are now installing solar panels on their rooftops to create energy using sunlight. 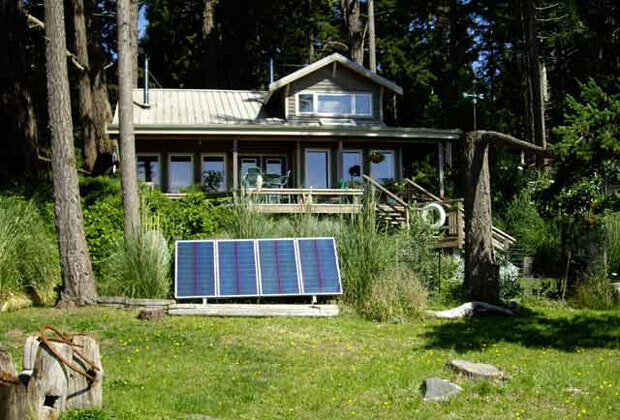 Households living off the grid use photo-voltaic solar panels installed on their roof or somewhere close by the house. The solar panels are made from components known as silicon semiconductors. When the sun is at its peak during the day, these silicon semiconductors harness the energy from the sun, store the electrons and break them down so they can move around independently. These free electrons travel directly down the electrical panels in the solar panels and generate DC, direct current. Through an inverter, the current is then converted in to AC, alternating current, which you can use as electricity to power the house. If you prefer the wind to power your house than the process involving wind energy is a bit different than solar energy. You can harness the power of the wind by installing a household wind turbine. A wind turbine resembles the propeller of an aircraft. This turbine sits on a 50 to 120 feet tall tower and is powered by nothing but the force of the wind. The wind powers and spins the turbine. The force of the turbine leads to a shaft which is connected to a hub in the generator below. The power of the spinning turbine is converted into electricity through an AC inverter which you can use to power your place. If you do indeed indulge in living off the grid, then you can either use one of the above mentioned methods or both. There are households who have installed both solar and wind energy mechanisms which they use alternatively for example, during the day they would use the sun to power the house and during the night they would use the gentle breeze to power the turbine and create electricity. There are some households who produce energy in excess of their needs. They can either sell the excess energy to a power company (if your state has no regulations against it) or store it and use later, but it is better to store and use because you will have initially cut ties with the power company. The technology involved in harnessing the power of the winds to produce energy is affordable, cost-effective and environmentally friendly. You can save a lot of money if you go with this option, plus it is also good for the environment, with no greenhouse gas emissions produced there are many environmentalists who are switching to wind powered technology. This way, it has become a favored option for tree huggers. You can also reduce your carbon footprint this way. Now that you totally depend on the power of the sun and wind to produce your own electricity, the next step in the ‘living off the grid’ process is to cut off the city’s water and sewage provision. A common fact is that most people are not aware of is the fact that water is everywhere. This gives you a couple of great opportunities to use water in order to live off the grid. According to the information provided by the ‘The Groundwater Foundation’, over 17 million American households sustain their own water provision, mainly by having wells dug. The process of digging wells is a fairly simple one. You need a huge driller to dig a hole in the ground beneath where water flows. Before doing this, confirm that your driller is licensed because there are well digging regulations for private use. Make sure that your driller is professional and experienced. You will need to be really careful to dig a well in the proper spots. If you don’t, there can be harmful contaminants which can leak into your well and your water supply. The cost will depend on the size of the well. The deeper the well the well, the more chances will be that a cleaner and more refreshing source of water will be found. You can also get a filter installed so the water tastes good. Another way of efficiently storing water is by getting a rain tank or a cistern. A cistern is a sort of a tank that can hold water. There are various home cisterns that you can installed depending on your requirements. You can either get a concrete system installed above or below ground or you can get a cistern made out of fiber glass and even steel. Rainwater that runs in your gutter system is directed toward the tank, filling it up with water. The water then goes into your home. If you have a tank installed above ground you can utilize the weight of the water to pump it into your water system. But a cistern will only help you if you live somewhere where it rains frequently. That being said, if you live near a polluted area, for example an expressway, then it is best that you install a clay roof over the cistern to ensure the water remains clean. You can even create your own sewage system for living off the grid. The most effective way you can get rid of your sewage is by using a septic system. It includes a large tank in which all your water goes. The bacteria then dissolve everything and creates layer for your waste. As more water comes in, the old waste gets pumped out via pressure. The waste flows through a series of pipes and into a drain field. These are some of the important things that you will have to consider when living off the grid. But there are some other little things you need to pay attention to as well, things like heating, backup power, and cooling. Living off the grid requires that you also keep yourself comfortable. You want to have enough cool and hot water. You want to have proper heating and cooling throughout your house. Many households that are living off the grid use propane tanks. You can use the energy you produce to provide electrical heat. However, this often will deplete your resources quickly. Propane is a good source for powering your heating and cooling systems. Fill the tank with propane, and then pump it into your house via pipes. Another way of heating your water is installing tankless heaters. Living off the grid requires that you don’t use any other industrial source, so you can’t use natural gas to heat your water. Tank-less heaters do not heat or hold water. You will have to heat the water manually for which you will need to put the amount of water you need heated in the tanks and use propane to heat it. Most households living off the grid also have backup generators installed. They do this in case they are not able to generate sufficient energy. In the winter, the sun often doesn’t shine enough. In the summer, wind may be scarce in daytime. It is smart to have a backup generator installed. You can install it with an automatic ‘switch on’ function. The generator will start automatically when there is no power. You can even resort to burning wood to create heat. Many people who are living off the grid use wood as a primary source of heat. Electric and gas heating appliances take up too much energy, that is where wood comes in. Simply chop it up and throw it in your fireplace. You can use wood to cook and heat your house at the same time. Get a sun oven and harness the sun’s energy to bake, cook, steam, and boil your foods. All in all, living off the grid can be a wonderful experience. You can be self-reliant and give back to the environment.